Telerivet’s new Developer Platform is here! We’re excited to launch our new and improved APIs and developer tools, which make it easier than ever for developers to build custom mobile messaging services and automate their SMS communication anywhere in the world. Over the past two years, thousands of organizations and developers have already built amazing messaging services with Telerivet’s platform — from e-commerce marketplaces communicating with buyers and sellers, to microfinance institutions communicating with borrowers and lenders, to logistics companies communicating with GPS tracking devices, to radio stations collecting opinions from their listeners. Now we’re ready to take mobile messaging APIs to a whole new level. 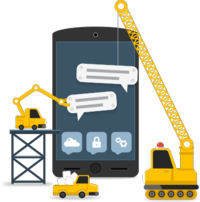 Telerivet’s Cloud Script API is a complete rethinking of the way mobile messaging services can be built. When using a traditional SMS gateway API, you need to run code on your own servers. In order to run your own servers, you’ll need to get a domain name, configure DNS servers, get a hosting provider, install web servers, databases, and other tools, and set up a local development environment. Many businesses and organizations that want to create a mobile messaging service don’t have the technical expertise to do all this. The barriers to entry are too high. Even expert developers can be bogged down by setting up and managing servers. The code runs entirely on Telerivet’s cloud servers, so developers don’t need to set up any servers or development environments — eliminating the technical overhead that prevents many people from creating their own solutions. Don’t worry, even with the new Cloud Script API, we’re not neglecting those of you who prefer to run code on your own servers. Telerivet has always had a REST API for sending messages from your own application or website, and a Webhook API to notify your server when new messages are received. But we’ve talked to many developers who want to do more than just send and receive SMS — and everyone wants to do something different. Some want to add signup forms on their website that let people subscribe to their SMS campaigns. Others want to build custom dashboards to display their poll statistics. Some want to monitor their Android phones from their own application. Others want to use Telerivet as their application’s primary data store. You should really check it out. Everything is documented in precise detail with code examples in several programming languages. We also have new Quick-Start Tutorials so you can get to the good stuff without having to read the entire reference. Send messages to groups. Update contact information. Insert variables into SMS messages. Store custom data. Send SMS polls and calculate statistics. Get the current status of your Android phone. Export M-PESA receipts (hello, Kenya!). And lots more. No need to write all the code yourself — we’ve already done it for you. To learn more about the updated APIs, visit the REST API and Webhook API documentation. Thanks to Telerivet’s new integrations with popular third-party software, even non-developers can take advantage of Telerivet’s APIs. By using Telerivet with Zapier, anyone can connect Telerivet to hundreds of other web apps, including Google Docs, Dropbox, Facebook Pages, Twitter, RSS feeds, Salesforce, WordPress, Stripe, incoming and outgoing email, and more. By using Telerivet with CommCareHQ, frontline health workers can use SMS to help gather and distribute information in developing countries. By using Telerivet with Cyclos, local banks and microfinance institutions can easily set up SMS banking systems that use Telerivet to send and receive SMS. Check out our new Developer Portal at https://telerivet.com/api, try out the new APIs, and let us know what you think! We’re constantly adding new features and improvements to the APIs, so feel free to keep sending us suggestions for new features that would be useful. Telerivet has seen amazing growth over the past few years, largely driven by our own user community. When our users find success with Telerivet, many of them tell friends and colleagues who are looking to implement mobile messaging in their own organization. Now we're excited to launch a referral program for everyone who introduces Telerivet to friends, contacts, and colleagues. As thanks for your referrals, you’ll be rewarded in the form of free Telerivet service. Every Telerivet user has a unique referral link to share via email, social media, or your own website. When someone signs up with your referral link and upgrades to a paid Telerivet plan, we’ll credit your account with $30 — enough for one month of Telerivet's Standard plan at no charge. To see more details and start sharing your referral link, visit the new Referral Program page in your Telerivet account. We’re working on building tools to support the growth of our community, and this referral program is just the start. Today, massive excitement is building around universal, open Internet connectivity. With the establishment of high-profile global projects like Facebook’s Internet.org, incalculable social and economic gains seem just at the horizon. For developers, too, that means the rapid multiplication of new opportunities for the deployment of the best tools for driving innovation and connectivity all over the planet. But the Internet isn’t the only technology driving innovation and connectivity, especially when it comes to mobile. A recent count put the number of mobile devices in the world at 7 billion—which is to say that the Age of the Internet is now also the Age of Mobile. SMS works on essentially all 7 billion of these devices, from smartphones to the ubiquitous feature phones of the developing world. Simply put, SMS texting is still the single most common use of all mobile devices anywhere—and use cases for SMS continue to multiply. One could say that SMS works so well it has become almost invisible. Even while Internet access and smartphones continue to spread, and as Internet-based messaging apps like WhatsApp proliferate, SMS is still changing the way we communicate, travel, organize our lives, and run our businesses. It has played a quiet, crucial role in some of the most disruptive endeavors of the last few years: Twitter’s system of 140-character status updates was born out of SMS. Urban transportation startup Uber has SMS functionality baked into its smartphone applications, as do more and more popular smartphone apps ranging from food apps like Sprig to dating apps like CoffeeMeetsBagel. A 2013 study by Forrester of 167 mobile-channel businesses found that 70% are already using SMS notifications, with another 16% planning to use SMS notifications in the next year. Similarly, 46% of businesses in the study already use two-way SMS, with another 18% planning to add two-way SMS in the next year. Why is SMS still becoming more popular for businesses despite the continuing spread of internet access and smartphones? As Steve French explains in a post on Wired.com, many companies that joined the smartphone app frenzy in the past few years are realizing that their new mobile app isn’t getting enough usage to justify the resources needed to build and maintain it. As a result, companies are now moving resources back to SMS—which is ubiquitous, interoperable, easy to use, affordable, and immediate. 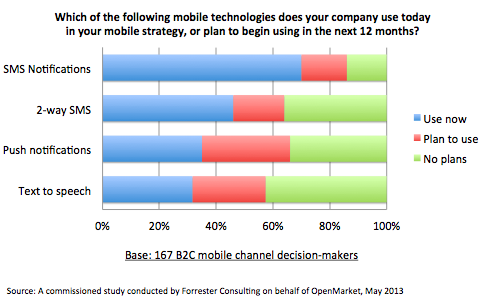 SMS also results in results in better customer engagement. Text messages have the highest open rate of any digital communication medium at 97%, compared to only 20-25% for email. In the developing world, SMS is also continuing to spur innovation—not least because it can go places the Internet can’t. SMS-capable feature phones are perfect for regions without reliable electricity or the bandwidth to support a data-hungry smartphone. Because smartphones and laptops don’t yet dominate the technology landscape in developing countries, SMS solutions have jumped further forward than they might have in countries with fully developed Internet infrastructure. But even as smartphones and internet access spreads around the world and as new communication apps like WhatsApp, Facebook Messenger, and WeChat proliferate, those apps will only ever reach a fraction of mobile users. It’s likely that no single messaging app will win the market globally. As a result, SMS will remain the most ubiquitous technology that organizations and businesses can use to communicate with anyone. SMS will play a crucial role in connecting us, fostering economic growth and our efforts to strengthen education, human rights, and global health. In conjunction with the Internet, it will continue to structure the life and work of people around the world. The best days of SMS are still ahead. Like many online services, we at Telerivet spent much of last week responding to the OpenSSL Heartbleed vulnerability (see our post-mortem here). While the lessons of Heartbleed are still fresh in our minds, now is the time for the software community to consider how we can improve our collective security and prepare for the next zero-day vulnerability. Whether the next vulnerability is in an open-source library, operating system, firmware, one’s own software, or a third-party service, many of the same lessons apply. Heartbleed is the perfect advertisement for Perfect Forward Secrecy. Thousands of web services all realized this week that their SSL private keys may have been compromised. Those without PFS enabled also realized that someone who had been recording encrypted sessions could have used their private keys to decrypt up to two years worth of previous traffic to their servers. But don’t just stop at enabling PFS — why not take this opportunity to enable HSTS in order to prevent against SSL stripping too? SSL configuration is hard to get right. Qualys SSL Labs makes it easy to test your server’s SSL setup and make sure it’s both secure and compatible with all the browsers out there. Try running their SSL server test on your own server, and follow their suggestions to improve your SSL config until you get an A or A+. Many of us were lucky to learn about Heartbleed very quickly on Monday when it quickly reached #1 on Hacker News. But system administrators shouldn’t rely on visiting the right website at the right time in order to react quickly to major vulnerabilities. Fortunately, most major projects have an email list to alert users of security vulnerabilities. When the next big zero-day vulnerability happens, don’t leave it up to chance whether you find out about it immediately or after it's already too late. Vulnerabilities in any of these third-party services could compromise customer data just as easily as vulnerabilities in the main service itself. Yet most services’ Heartbleed post-mortems haven't discussed the risk of vulnerabilities in the third party services they use. In the case of Heartbleed, all of the services above were affected for at least some time before being patched. It’s hard to say with certainty that nobody used Heartbleed to extract user data from any of these services. And now that we know for sure that attackers can use Heartbleed to steal SSL private keys, it’s hard to say that nobody MITMed them either, though that would be more difficult to do on a large scale. The Heartbleed vulnerability was surprising in some ways — how was such a critical part of the world’s security infrastructure broken for so long with so little review? But it isn’t as surprising as one might think. There is an unmeasurably massive amount of code in the wild that almost everyone online relies on every day. And in any of those obscure lines of code there might be one simple programming mistake that was overlooked in code review, missed by a static analyzer, and deployed into production. It has happened before and it will surely happen again. As a developer, this means that it’s necessary to design your systems with multiple levels of security to mitigate the damage if one part of your system’s security fails, whether because of a vulnerability in your own code or someone else’s code. For session ID exposure: requiring users to re-authenticate when changing IP addresses. For password exposure: requiring two-factor authentication, or requiring users to approve logins from new IP addresses. For secret key exposure: enabling Perfect Forward Secrecy so that a MITM attacker couldn't decrypt previous encrypted sessions. In general, imagine that an attacker was able to get through one level of your security, and think about how you can still prevent them from doing something even worse. For example, imagine that an attacker somehow gained read-access to your database through a SQL injection vulnerability, or somehow gained access to your database backups. Then it would help if sensitive fields in your database were encrypted with a key stored outside the database. Or imagine one of your employees’ laptops was stolen. It’d help if any customer data or secret keys on it were encrypted in a TrueCrypt volume. Or imagine that an attacker already had root access to one of your database servers. Then you're in big trouble, but it would still help if you used Tarsnap with a write-only key so that they couldn’t just delete all your data along with all your backups. And although “security by obscurity” is a bad foundation for a cryptosystem, obscurity is a perfectly valid additional layer of “swiss cheese” in a security system. Simply making things harder to find — like choosing a non-default port for your SSH servers — can at least buy you valuable time when the next zero-day is being exploited. Since it is inevitable that another “Heartbleed” will happen again, defense in depth is the best way to make sure your users stay as protected as possible. The two most secure types of software are the software that never ships and the software that does nothing at all. Unfortunately, neither type is very useful to anyone. In practice, we all have to make tradeoffs between competing priorities like shipping, adding features, and improving security. While the lessons of Heartbleed are still fresh, let’s all at least take a moment to make sure we’re well prepared for the next big zero-day vulnerability. What do you think the software community should do to prepare for the next Heartbleed? Last Monday, a major security vulnerability called “Heartbleed” was announced in OpenSSL, security software that is widely used by web services in order to protect the privacy of communication on the internet. The Heartbleed bug affected many internet services — including Google and Yahoo — making it possible for their web servers to leak users’ private information, including account passwords. The privacy and security of our users is extremely important to us, so we’ve written this update to explain how Heartbleed affects Telerivet users, as well as the actions Telerivet has already taken to protect your privacy and security. Most importantly, Telerivet’s production servers were not vulnerable to the “Heartbleed” bug, since we were fortunately using a version of OpenSSL that did not have the bug. However, some of our internal testing servers were vulnerable until last Monday afternoon, and we also inadvertently ran one unpatched server for less than 5 minutes on Thursday. Also, some third-party services that Telerivet uses to handle messaging, customer support, analytics, and payments (Twilio, Nexmo, Intercom, KISSmetrics, Sift Science, and Stripe) were vulnerable to Heartbleed until last Monday or Tuesday, but have since been patched and secured. After a thorough security audit of Telerivet’s systems, we have no reason to believe that any of Telerivet users’ private information was exposed due to the Heartbleed vulnerability. We’re not requiring users to change their Telerivet password, although any concerned users are encouraged to do so. In particular, it may be a good idea to change your password if you use the same password on other services that were vulnerable. It’s possible that the vulnerabilities in third-party services may theoretically have allowed certain Telerivet customer information such as names, email addresses, and payment information to be exposed, although all of these services currently report no evidence that any data was improperly accessed due to the Heartbleed bug. We have already rotated the secret keys and SSL certificates that Telerivet’s servers use to encrypt communications, while revoking our old certificates, in order to ensure that Heartbleed poses no future risk to Telerivet users. (Although the date on our SSL certificates hasn’t changed, they actually are using entirely new keys.) In addition, we notified a small number of users who logged in to the unpatched server during a five-minute interval on Thursday, and subsequently regenerated our SSL keys and certificates. We have also required all Telerivet staff to reset all passwords for all services impacted by the Heartbleed vulnerability. In addition to taking immediate steps to respond to this particular vulnerability, we’ve also taken this opportunity to review Telerivet’s security for other areas for improvements, and have already implemented several changes to make our security even stronger than before. In particular, Telerivet’s SSL implementation now supports Perfect Forward Secrecy and HTTP Strict Transport Security, and our SSL implementation now receives an “A+” grade from Qualys’s SSL tester. Heartbleed was likely the most serious security vulnerability in several years, and affected nearly every web user and every web service. Fortunately, there is currently no evidence that any private information related to Telerivet has been compromised due to the Heartbleed vulnerability. And even better, companies everywhere are now taking this opportunity to strengthen their security even further to prevent other vulnerabilities in the future, which will be good for the average user in the long run.